Off to Italy again. This seems like a good time to share a link to a video of an illustrated talk Ada gave at the Lumen Christi institute in Chicago in February. It’s a fascinating overview of the place of San Marco in Florence, with lots of excellent pictures. It’s like an audio version of an Ex Urbe post, with Fra Angelico, the meaning of blue, the Magi, the Medici, Savonarola, confraternities, and the complexities of Renaissance religious and artistic patronage. 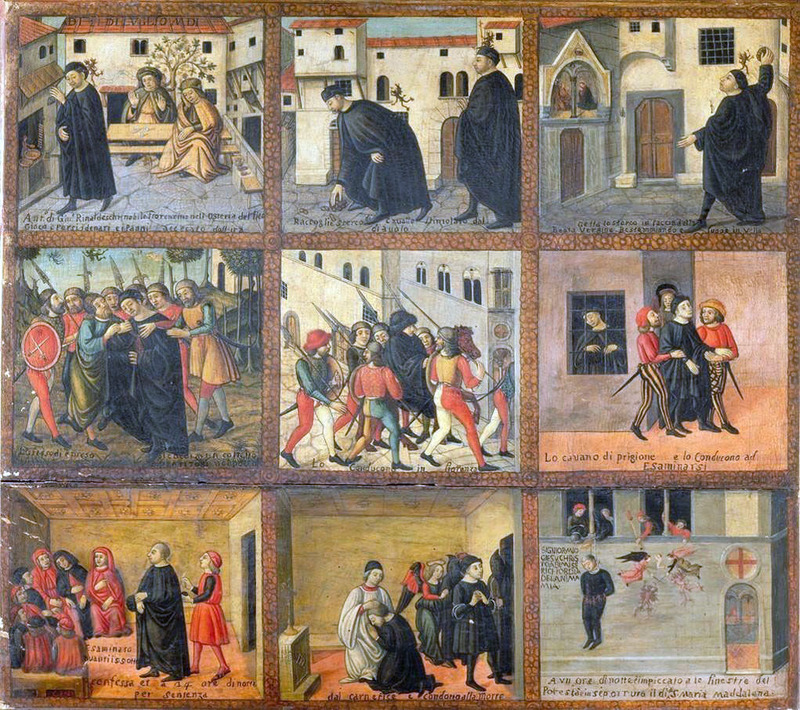 And here’s one of the pictures mentioned but not shown in the presentation, a nine panel illustration by Filippo Dolcaiati “The History of Antonio Rinaldeschi.” It depicts the real historical fate of Rinaldeschi, who became drunk while gambling and threw manure at an icon of the Virgin Mary. A fascinating incident for demonstrating the functions of confraternities, and for demonstrating how seriously the people of Florence took the protection offered by saints and icons. In the matter of city scale, “The whole city of Florence can fit in one Atlanta cloverleaf”: http://www.treehugger.com/urban-design/you-cant-set-shop-side-expressway.html. Great talk! During the lecture you recommended a very interesting (and very dry) book on the reasons for Florence’s rise to prominence. Do you happen to remember the title? Oh, here it is, on YouTube: https://www.youtube.com/watch?v=llknZo6UCIY! Thank you, Marius, that’s perfect. The post is now updated to include your new link. I really appreciate this.